Better check your cabinet! The Kellogg company is recalling many of their Honey Smacks cereals due to an outbreak of salmonella. The company recalled all of the Honey Smacks with a “best if used by” date from June 14, 2018 through June 14, 2019 with their 15.3-ounce and 23-ounce packages. The 15.3-ounce Honey Smacks have a UPC code of 38000 39103, while the 23.0-ounce boxes have a UPC code of 38000 14810. For those who are unaware, the UPC code is at the bottom of the box. Kellogg’s is warning customers not to eat the cereals and to throw them away, or return boxes to the place of purchase for a refund. If some of the cereal was already eaten, click here. According to reports from the Centers for Disease Control and Prevention and the U.S. Food and Drug Administration, the product has already sickened 73 people in 31 states. Additionally, 24 people have already been hospitalized. Fortunately, there have been no deaths reported so far. The Food and Drug Administration says the products were distributed across the United States as well as Guam, Saipan, Costa Rica, Guatemala, Mexico, the Caribbean and Tahiti. “The FDA’s staff has initiated an inspection at the facility that manufactures Kellogg’s Honey Smacks and is working quickly with the company to collect additional information,” the agency said in a statement. Currently, the CDC, FDA, state and local health officials are working together to identify the root source of the contamination. The company is investigating a third-party manufacturer that produces the cereal. The FDA is also conducting research to find out more about the manufacturer and other products they make. The FDA reports that most people with salmonella develop diarrhea, fever and abdominal cramps. The illness usually lasts four to seven days. Most people can recover without treatment, but the sickness can cause fatal infections in children, the elderly and those with weak immune systems. In some cases, according to the FDA, salmonella can create a scenario where the organism can get into the bloodstream, causing more severe illnesses. If you have consumed Honey Smacks and have any of the above symptoms within 12 to 72 hours, contact a healthcare provider immediately. Hey Buddy!, I found this information for you: "Caution: 73 Salmonella Cases Came From This Kellogg’s Cereal". 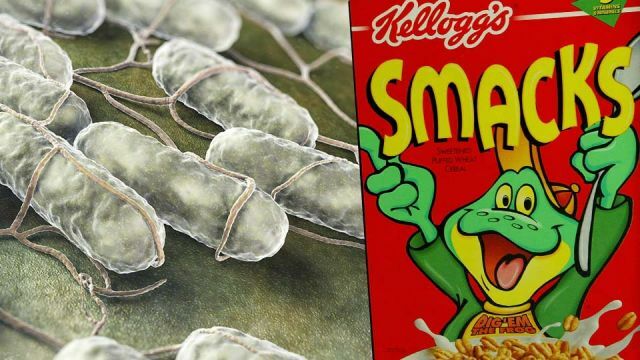 Here is the website link: https://www.thealternativedaily.com/salmonella-outbreak-in-kelloggs-honey-smacks-cereal/. Thank you.